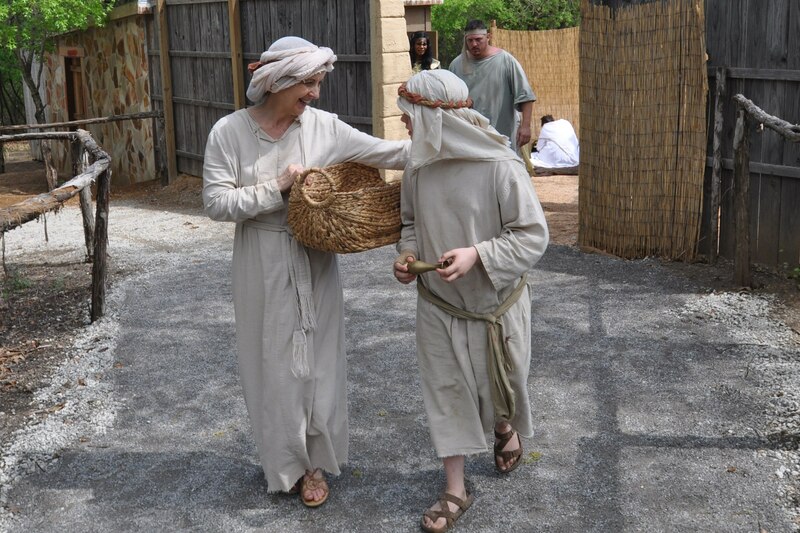 Twila Barnett, founder of the Weatherford Acting Academy and a well-known local acting coach and actress, plays my mother in The Passover Experience. She is really great to work with. I just finished my first weekend playing the role of Abraham in The Passover Experience. I’ve been performing since I was 7, and I’ve done live shows before. But I don’t think I’ve ever worked so hard. It was an AMAZING weekend! So much fun. 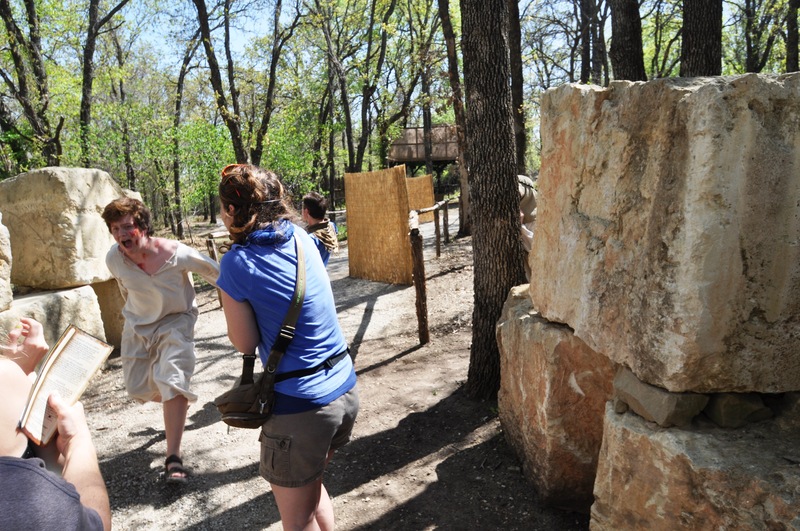 On Friday, opening day, I performed 8 or 9 “interactive” shows along The Path of Plagues section of the show. There are 3 actors playing Abraham, and we rotate, so that there is a short break between the end of each section. We perform for small groups of 10-15 guests, and the more guests there are, the more shows each of us does. On Saturday, I did 23 individual shows! Here’s a link to the video that WFAA TV shot of part of the show — I didn’t make it into the video, but it’s a nice overview of what you’ll see if you come to next weekend’s show. Like the reporter says, if you come, wear comfortable shoes. The show takes place on a 5-acre site, and there is a lot of walking. Golf carts take people up and down hills on request, though, so don’t be afraid to come if you use a walker, wheelchair or cane. My grandma uses a walker, and she got around fine with help from the golf carts. The marketplace, where food and souvenirs are for sale. The Path of Plagues, the longest part of the experience in terms of distance, where they can experience what it might have been like to be a Hebrew slave in Egypt, what the plagues that God used to convinced the Egyptian pharaoh to release the Hebrew slaves were like, and what the first passover was like, when the angel of death took the firstborn male in every house that did not follow the instruction to put the blood of an innocent lamb on the doorpost. 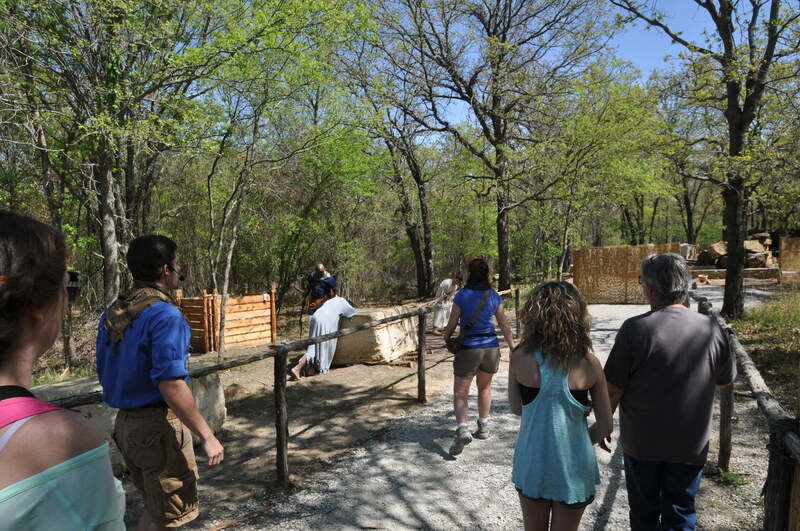 The sculpture garden, which has hand-carved status of Bible stories, and a cave that shows what it looked like when Mary and Martha arrived on Easter morning to find the tomb empty. 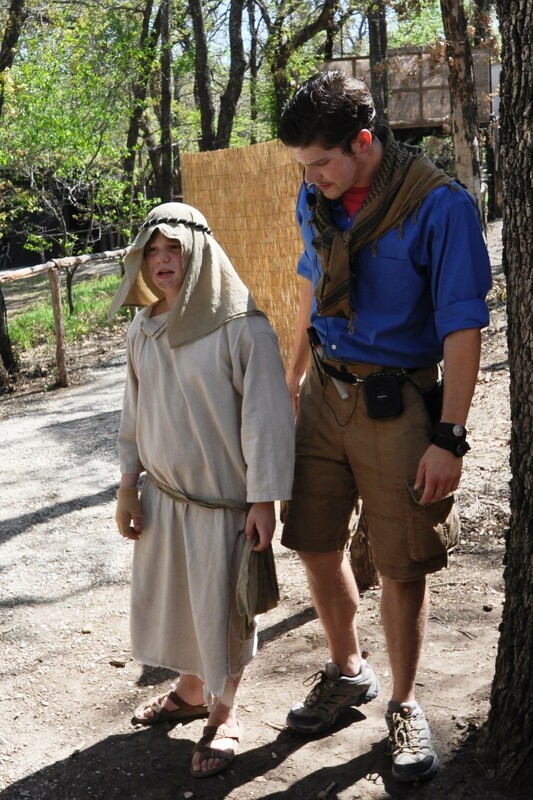 This is me with Paul, one of the tour guides I work with at The Passover Experience. My character is a Hebrew boy who meets some time travelers and their guides when he is hiding from a “scary man” covered in boils. Audience members are the time travelers, and the guides are actors who lead them through the experience, interacting with the actors as they go.The people who visit the experience get really into it. Some parts of it (like the plague of locusts, the river of blood, the plague of darkness, and the plague of hail — not to mention the angel of death you don’t see, but certainly hear) are pretty scary, and I saw more than one adult who was really scared. 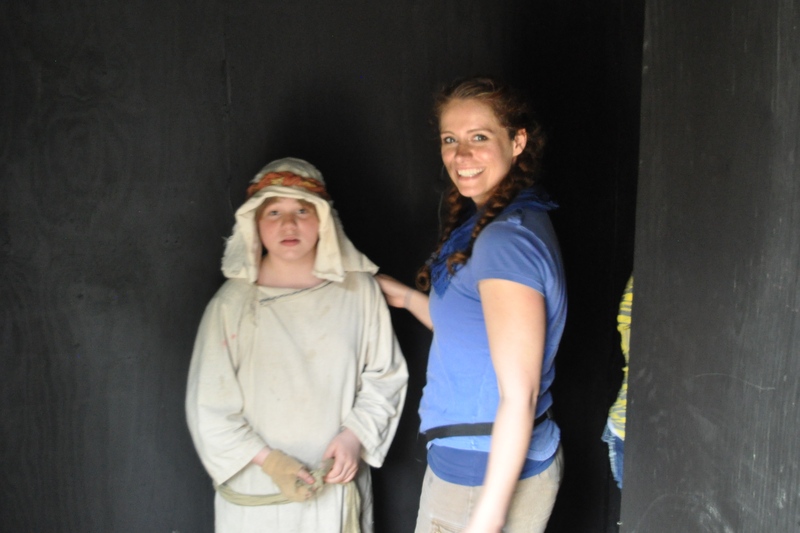 But the cool thing is how some of the kids and adults will really get into the act, telling the slave overseer not to hurt the slaves, or to let the people go, and trying to warn some of the characters about what is coming.I’ve never had a part where it’s ok to interact directly with the audience. Usually, I’m on stage, and they’re in the seats out front, and you can’t really see them and certainly can’t talk to them. But here, they can ask us questions, make comments, and really interact with us. It’s cool, but it makes me glad that Nancy Chartier and Nic Rainone (my acting and improv/clowning coaches) have drilled me in the right way to improvise in front of an audience. Nic says that the key is to be able to predict how they will react. Some people have a sense of humor and will play along — and others will get angry if you respond in a way that might be funny to someone else, but offends them. And, since we’re retelling stories from the Bible in this show, we have to be extra careful not to say something that will offend anyone. We’ll be performing on Friday and Saturday, too — so come out and see me! Tickets are available at the gate, or online, and we keep performing even if it rains. Besides, we’re in Peaster, Texas (northwest of Fort Worth, just past Weatherford), so if it’s raining in Dallas it probably isn’t raining where we are. Directions are online at this link. Here are some more photos from the first weekend’s shows. I can’t wait for next weekend! Can you find me? (I’m hiding behind the tree from the “scary man” with boils, who chases me into the guests at the beginning of the Path of Plagues). The tour guide is smiling, but we’re standing at the entrance to the shelter for the Plague of Locusts and darkness — and it’s a pretty scary part of the show! You feel the “locusts” and it is truly a “darkness you can feel”. Lots of kids don’t go through this part of the show, and I’ve seen some adults get really scared, too. One of the first things visitors see on the Path of Plagues is an Egyptian overseer and some Hebrew slaves — the make-up is amazing, and the overseer can be pretty scary with that whip of his! I’m in the Path of Plagues part of the story, but there are lots of happier scenes for visitors, too. 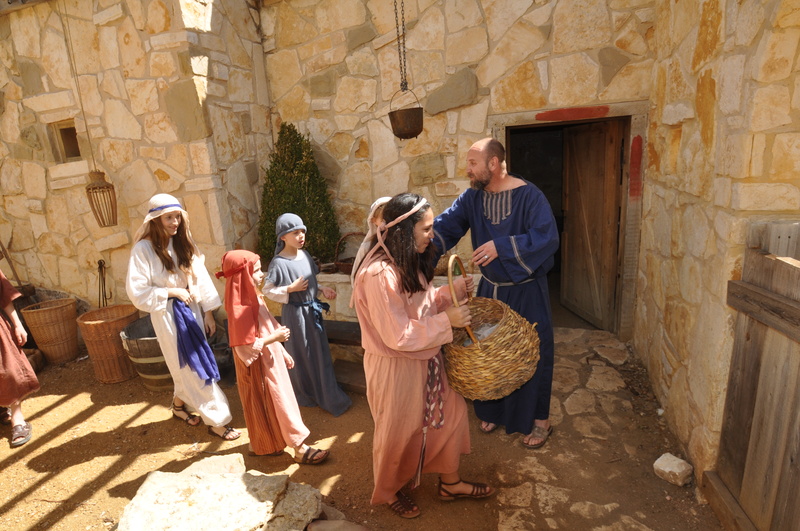 Whole families show how families lived at the time of Christ, and there are demonstrations of things like how to make unleavened bread and even a Passover seder every hour where visitors can taste the seder foods that remind people about the Exodus and the first passover.